Don’t choose cheap shade sails in Adelaide – only go for shade sails that use Rainbow Shade fabrics! 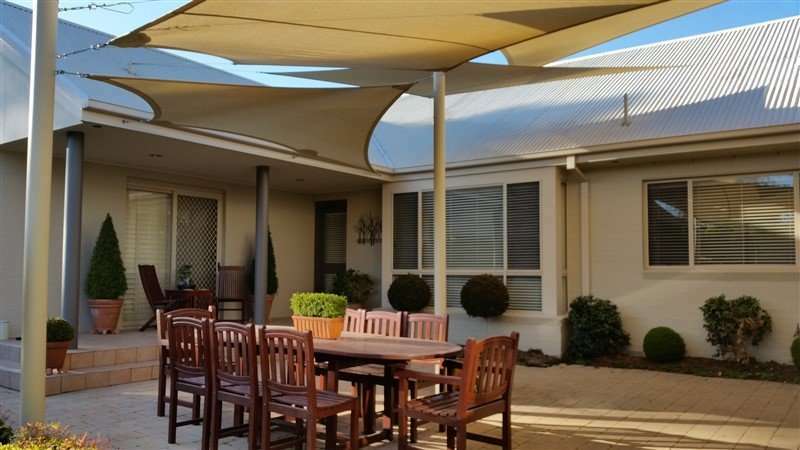 Rainbow Shade is an industry-leading supplier of quality fabrics for shade sails in Adelaide as well as all over Australia. Our fabrics enable shade sail manufacturers to offer the highest quality products to their customers. We have well over two decades of experience in the industry and an excellent reputation behind us. Because of this, we are the preferred partner for many shade sail manufacturers in Adelaide. We all know that the sun can be damaging to one’s health. However, did you know that Australia receives an abnormal amount of UV radiation, which is the primary cause of skin cancer? No wonder shade sails are so popular across the nation. When you take a closer look at our product range, you will see why we are considered leaders in our industry. It has always been our mission to offer fabrics of the highest quality, which also offer all-weather protection to end users. All our fabrics have been designed to cater to harsh Australian weather conditions and meet the highest standards of quality. Mehler is a heavy-duty, waterproof PVC fabric that is intended for use in commercial shade sails. Designed to offer superior strength and stability, shade sails made from Mehler fabrics are commonly used in large structures and other commercial applications. Mehler exhibits proven longevity and durability, high tensile strength and easy maintenance. This fabric is also UV rated, has been fungicide treated and is a flame retardant. Z16 is the most popular fabric for shade sails in Adelaide, as it is lightweight and incredibly easy to setup and maintain. Z16 offers exceptional UVR protection of up to 99% and features high tensile strength and proven longevity. Available in 22 designer colours, Z16 is extensively used in commercial and residential shade sails across Adelaide. DRiZ is another popular fabric, which offers all the merits of Z16, with the added benefit of being waterproof. This fabric also offers natural transmission of light, while providing UVR protection of up to 100%. DRiZ enables manufactures to create waterproof shade sails that offer protection from the sun, rain and the wind. eXtreme 32 is another high-quality fabric, which is ideal for large shade sails applications in Adelaide. This fabric finds extensive use in commercial shade sails, such as in playgrounds, car parks and large commercial structures. Known for its durability and exceptional strength, this fabric offers excellent UVR protection of up to 95.8%. As a measure of quality, we back all our products with impressive warranties. While eXtreme 32 and Z16 feature a 10-year limited warranty, DRiZ is backed by a 5-year limited warranty. Mehler is a PVC fabric that has state of the art coatings and for this reason we offer a 10 to 20 year limited warranty on it. Why choose Rainbow Shade fabrics for your shade sails in Adelaide? Whatever your intended application, you must ensure that they shade sails you choose are of a high quality. Unfortunately, it is almost impossible to find high-quality shade sails by simply walking into your local hardware store. Most hardware stores in Adelaide offer low-quality shade sails that will last you only a few years at best and have low levels of protection. Rather, you must ensure your shade sails are made from quality fabrics that offer protection from the sun, rain and the wind. Moreover, your shade sails should be robust enough to last you many years. Shade sails that are manufactured out of a Rainbow Shade fabric offer all this. Our fabrics boast exceptional UVR protection and exhibit proven durability and longevity. They have also been tested and designed specifically for Australian conditions. Rainbow Shade is the preferred shade fabric partner for many shade sail manufacturers in Adelaide. Wherever you’re located in Adelaide; Albert Park, Aldgate, Beaumont, Beaumont, Bridgewater , Brighton, Clarence Gardens, Collinswood, Craigburn Farm, Evandale, Evanston, Fitzroy, Flinders Park, Fullarton, Glenelg, Glenelg, Highbury, Ingle Farm, Ingle Farm, Malvern, Malvern, Manningham, Marino, Mile End Westbourne Park, North Adelaide, Norwood, Parkside, Pennington, Port Noarlunga, Renown Park, Ridgehaven, Seaview Downs, Seaview Downs, Sheidow Park, St Peters Belair, Thorngate, Toorak Gardens, Torrensville, Tusmore, Unley, West Beach, Westbourne Park, Wingfield or anywhere in between, you’re sure to find a shade sail manufacturer that uses our fabrics. Don’t ignore the importance of high-quality shade sails. Purchase shade sails that are only manufactured using a Rainbow Shade fabric. Get in touch with us at 07 5580 5366 and we’ll put you through to your closest partner in Adelaide today.